Privacy – Get Involved TODAY! MenuReadmeHomeEditorialsAbout/ContactSecurity TipsPrivacy - Get Involved TODAY! As I mentioned in a previous post, to expand my knowledge, I am working through the labs in the book Practical Malware Analysis by Michael Sikorski. In this post, I will demonstrate my findings in Lab 11-03, which illustrate entry-point redirection. Why would malware even want to use entry point redirection in the first place? It allows malware to take a perfectly legitimate file, inject malicious code into it, and then run that code by changing the entry point address in the legitimate file’s header such that when the file is executed, the computer runs the malicious code immediately before the original program. It’s important to note that the malicious code may or may not transfer execution back to the original legitimate code inside the file. If execution is transferred back to the legitimate code, then this type of attack is even harder to detect since everything appears to function as normal. Note: I will be documenting the full analysis in this post. If you are only interested in the actual execution redirection process, click here. The specific section (data structure) inside the Portable Executable file header (IMAGE_NT_HEADERS4, literally) which stores the entry point address is called IMAGE_OPTIONAL_HEADER5, which has a DWORD member entitled AddressOfEntryPoint . 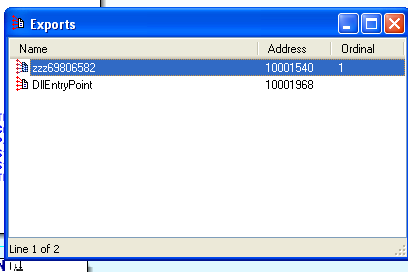 AddressOfEntryPoint simply stores the memory address which corresponds to the program’s very first instruction. Ironically, the IMAGE_OPTIONAL_HEADER is not optional at all and in fact stores critical information for the PE file to load properly when it’s executed. This is a lot of jargon but, put in plain terms, when a user executes a .exe file, the Windows Loader consults the PE Header to find out how much memory to allocate for the initial program’s data, instructions, resources, and also where the program should begin, hence the AddressOfEntryPoint. It is easy to see how program execution is impossible without the “optional” header. 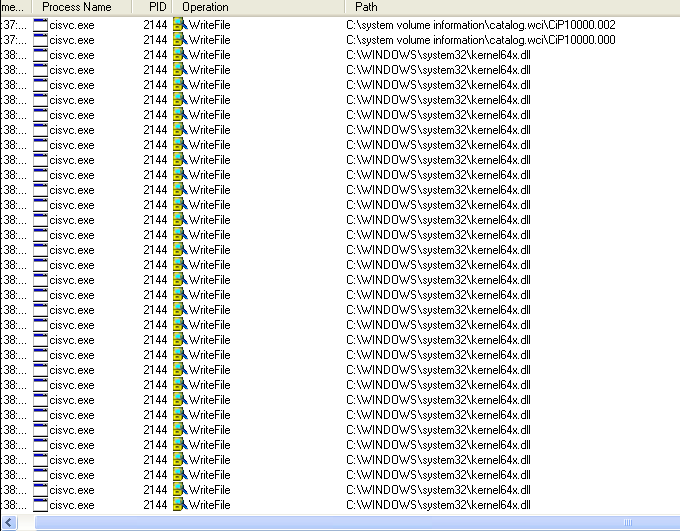 The malware sample came in the form of two initial files: Lab11-03.exe and Lab11-03.dll. Of course in a production setting with the malware in the wild, they wouldn’t be so named. The biggest ones that stood out here were inet_epar32.dll, cmd.exe, net start cisvc, and “zzz69806582”. Lots of clues that this malware is doing some funny business with DLLs, probably hooking and injecting them into a process; perhaps cisvc.exe which it is launching as a service, as noted by the “net start” command.7 Net start goes hand-in-hand with cmd.exe, which is likely being used to run it. I flagged the TlsAlloc, TlsFree, and TlsGetValue in case this file was trying to employ some TLS callback anti-debug techniques, which it was not in the end. The two dlls were suspicious for reasons mentioned above about the previous DLLs. GetForegroundWindow and GetAsyncKeyState can be used to log keystrokes, so we may be dealing with a keylogger. 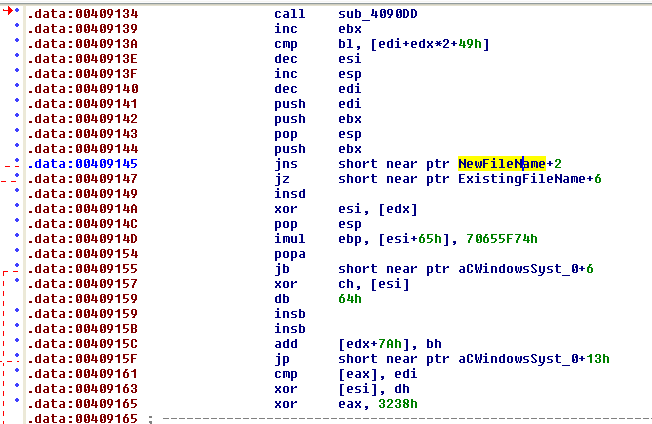 There was also the suspicious “zzz69806582” which made another appearance in the DLL. But there is no apparent log file here… Hmm… Maybe it’s not a keylogger. A background process in Windows, the Content Index Service catalogs and tracks files on the hard drive and indexes them for faster search results. Initially introduced in 1996, the Content Index service was crucial for finding files in versions of Windows until Windows 7, when Microsoft introduced Windows Search. At this point, I took a little sidetrack to get familiar with cisvc.exe and cidaemon.exe and actually opened them up in PE Studio as well. I will not be posting the strings and symbols found in them though as they do not directly relate to the malware and are in fact legitimate Windows programs, but I wanted to learn more about these files so that I could detect anything suspicious that may happen after I ran the malware. I did note that cidaemon used COM functions such as CoInitializeEx and CoCreateInstance as well as NtSetInformationProcess and NtQueryInformationProcess though. The lab questions prompted me to go ahead and start dynamic analysis. Just as suspected, the malware fired up cisvc.exe and cidaemon. But why? We aren’t doing any intensive searching, are we? Yup, it’s a keylogger, or at least has that functionality… We don’t yet know, maybe it does more. This is always entertaining but a little creepy to find, especially when it’s logging everything in real-time as I am analyzing it. I noticed no network activity associated with this and didn’t see any network indicators in basic static analysis either so I decided it was time to open this up in IDA for advanced static analysis and find out how this malware worked its magic. This is where the real fun begins – figuring out the how. 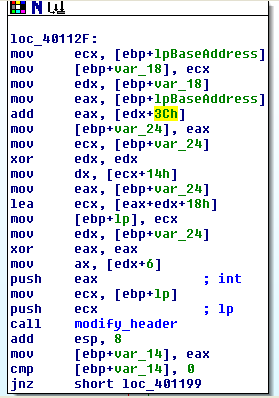 This first shot shows the malware first attempts to open a mutex, then if it cannot locate it, it creates a new one. 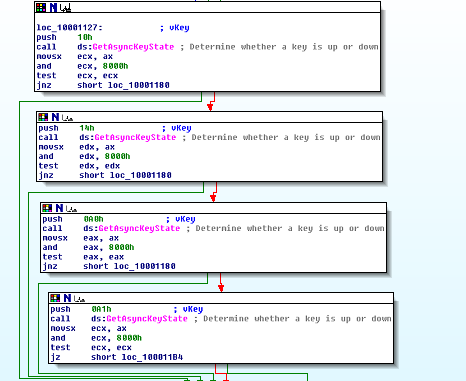 This is a way for the malware to ensure that the keylogger is not already running in the background on the machine. If it is, it exits this instance. The calls to GetAsyncKeyState are a dead giveaway of the keylogging functionality. The surrounding function that these calls appear in has a lot of complicated assembly code, but a cursory view of these calls explain what’s going on. This is the code that writes to the kernel64x.dll logfile the recorded keystrokes. Modified pages in the unmapped view are not written to disk until their share count reaches zero, or in other words, until they are unmapped or trimmed from the working sets of all processes that share the pages. Even then, the modified pages are written “lazily” to disk; that is, modifications may be cached in memory and written to disk at a later time. To minimize the risk of data loss in the event of a power failure or a system crash, applications should explicitly flush modified pages using the FlushViewOfFile function. There’s a strangely subtle message in there about UnmapViewOfFile saving the file back to disk. At this point, I had no idea that UnmapViewOfFile did this, and assumed that it would be a separate API call. Knowing that rep movsd takes ecx number of bytes from the source index (esi) and places them into the destination index (edi), I further examined what was in the source index… The suspicious offset! After glancing over this memory which was in the .data section one more time, and came up with nothing… EXCEPT, I noticed an E9h in an adjacent memory address. I knew that E9 was an x86 opcode from prior experience, so I decided to just click on it and press hotkey “c” and JACKPOT!!! IDA displayed a whole heap of assembly code which was embedded right here in the .data section of the file starting at the aforementioned offset… Shellcode. There it is! That’s all we need to know that this code which is placed inside of the .data section of Lab11-03.exe is being transferred (written to) cisvc.exe while loaded in memory, then finally closed out and saved by UnMapViewOfFile. The keylogger is therefore masked by a seemingly legitimate system process, even if he/she presses Ctrl+Shift+Escape and checks the process list. If the user searches Google for cisvc.exe in suspicion, Google will return results specifying that the file is indeed a legitimate Microsoft file. The logfile which is logging the keystrokes itself is also masked by being improperly labeled as a .dll file when in fact it’s a text file. Be suspicious of offsets to data in uncommon locations, and don’t forget the possbility of shellcode, which are just opcodes hidden away in plain old memory bytes. Malware often has to take obscure, ridiculous paths of execution in order to try to avoid detection, therefore it is important to be open-minded and know that typical programming practices probably won’t be followed. For example, instead of loading the malicious DLL into Lab11-03.exe, the program modified a system file to load the DLL, whereas with a legitimate program, there would be no need or desire to do this. 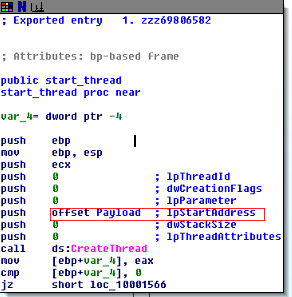 Entry-Point redirection is just one of many methods malware can use to try to hide itself. Learning it not only helps detect this specific type of attack, but also helps in learning the thought processes behind it, which are common to many other types of attacks as well. Lastly, we used all static analysis here but we could have opened up the files in a debugger like OllyDbg and figured much of this out that way as well. Stay tuned for articles on other methods malware uses to hide itself soon. Working With the AppInit_DLLs registry value. Microsoft Support. https://support.microsoft.com/en-us/help/197571/working-with-the-appinit-dlls-registry-value. Published November 21, 2006. Accessed March 24, 2017. How Secure Boot Works on Windows 8 and 10, and What It Means for Linux. HowToGeek. https://www.howtogeek.com/116569/htg-explains-how-windows-8s-secure-boot-feature-works-what-it-means-for-linux/. Published November 1, 2016. Accessed March 24, 2017. 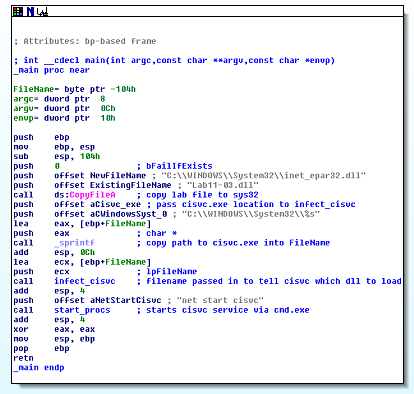 Cisvc.exe Windows process – What is it? Neuber Software. https://www.neuber.com/taskmanager/process/cisvc.exe.html. Accessed March 24, 2017.
pestudio. PE Studio Official Website. https://www.winitor.com/index.html. Accessed March 24, 2017. Net start. Microsoft TechNet. https://technet.microsoft.com/en-us/library/bb490713.aspx. Accessed March 24, 2017. 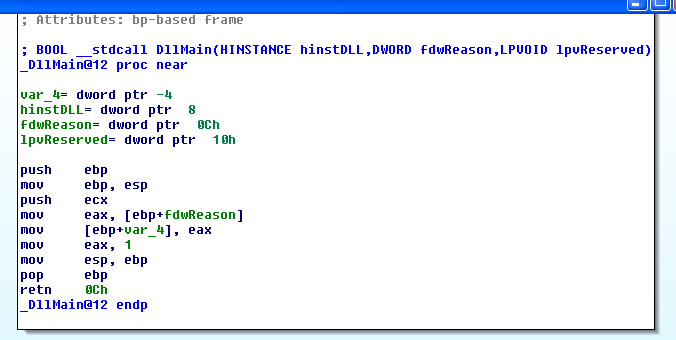 IDA Support: Freeware Version. Hex-Rays. https://www.hex-rays.com/products/ida/support/download_freeware.shtml. Accessed March 25, 2017. DoubleAgent: Taking Full Control Over Your Antivirus | Cybellum. Cybellum. https://cybellum.com/doubleagent-taking-full-control-antivirus/. Published March 22, 2017. Accessed March 24, 2017. Copyright © 2019, Todd Cullum Research. Proudly powered by WordPress. Blackoot design by Iceable Themes.